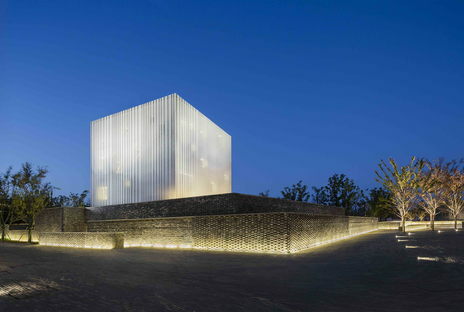 Suzhou Chapel is a building with many merits designed by the well-known studio Neri & Hu of Shanghai. 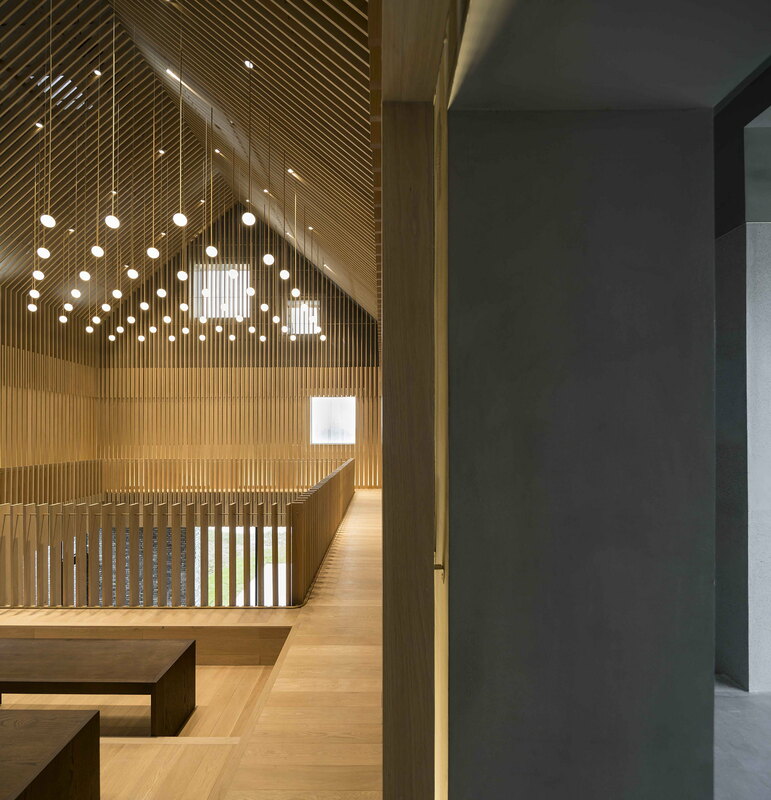 Located in a dense residential neighbourhood in the city of Suzhou, the chapel is designed to be a place for worshipping and meeting. 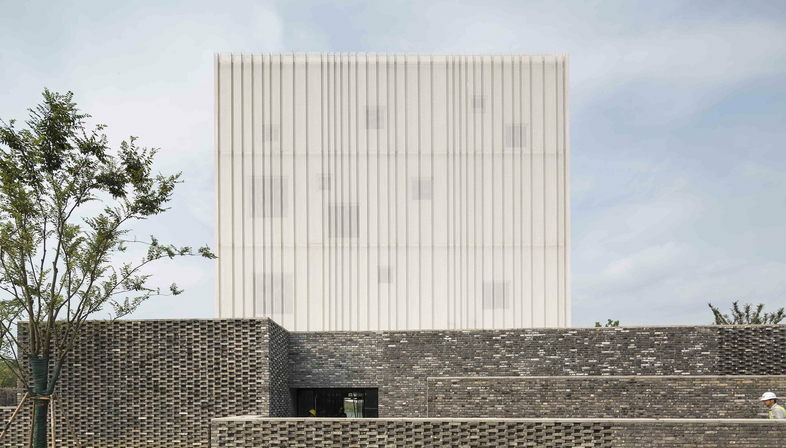 The successful Shanghai studio of Lyndon Neri and Rossana Hu designed Suzhou Chapel for the community of Suzhou, a city in China’s Jiangsu Province. 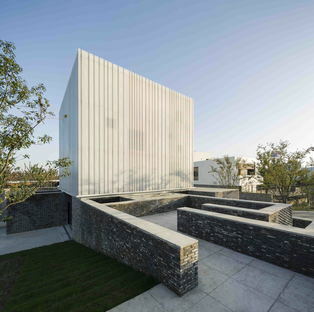 Its religious and civic vocation offered Neri & Hu their inspiration for their aesthetic and compositional choices. 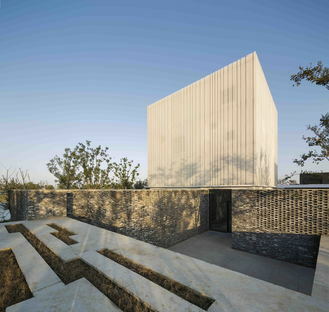 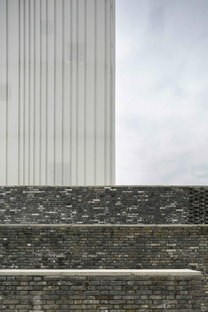 Suzhou Chapel is set up like a council chamber, a single architectural centre reached by a well-defined outdoor pathway. 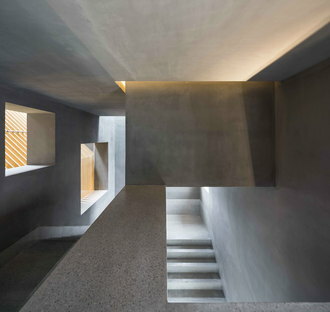 The architects make very few concessions to luxury or decoration, because their dominant style is asceticism, perfectly illustrated in Pedro Pegenaute’s photographs. 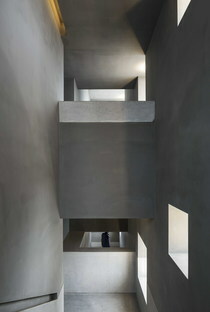 The key to interpretation of the project is continual revelation through the discovery of space. 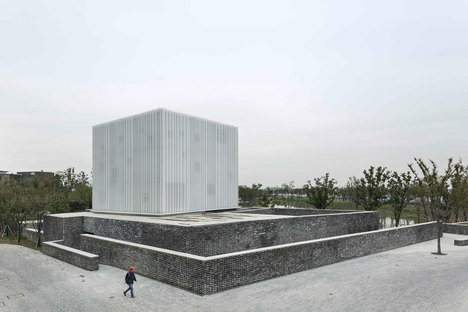 From a distance, the metal cube containing the chapel clearly stands out from a series of walls at different levels separating it from the square in front of it. 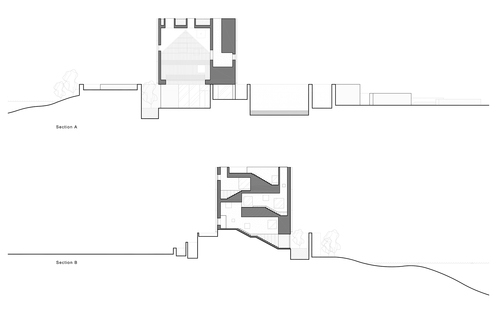 As we approach it, the walls become a solid backdrop, appropriately positioned to draw paths. 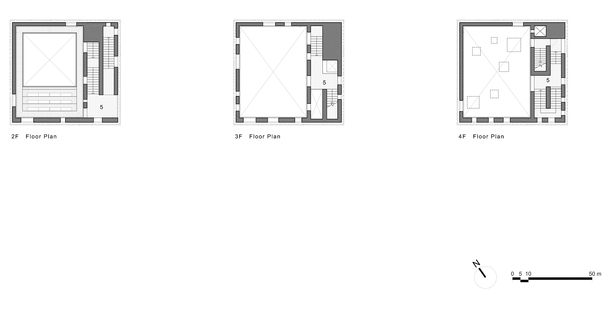 Thus we approach the “temple” peripatetically, via walkways on different levels surrounded by walls. 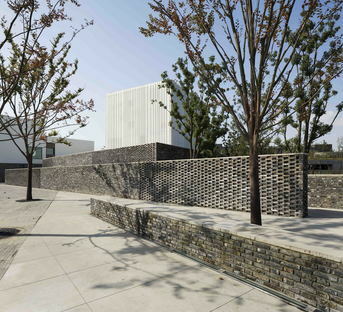 These particularly carefully designed walls are made up of little grey bricks laid alternately on edge and on end, revealing a relief pattern on the surface with a wealth of subtle material qualities. 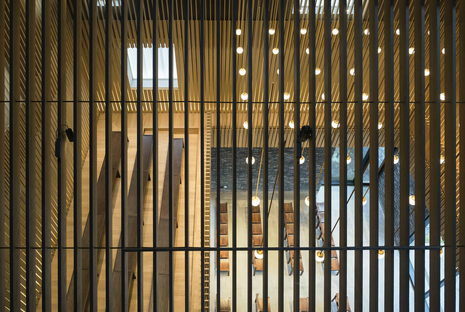 The route for accessing the chapel becomes an adventure in the perception of details, preparatory to striving for concentration. 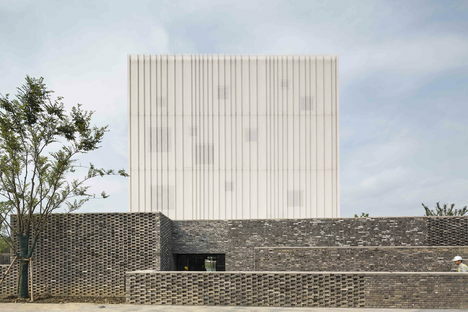 The space where religious ceremonies and community meetings are held is a concrete volume with a double skin, in which the outer skin is a bent, perforated white metal surface, while the inner skin is a wooden box dotted with windows of different sizes. 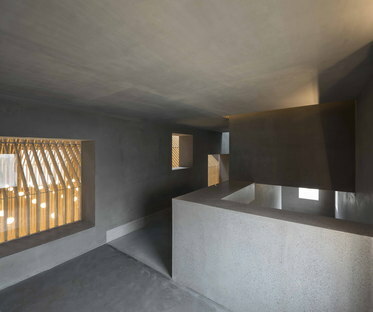 The windows appear to be randomly positioned when seen from the outside, but are actually designed to reflect the layout inside. 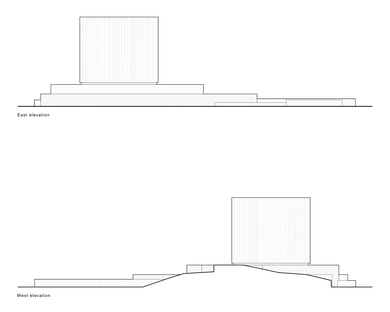 There are also numerous openings on the roof and in the upper part of the building to bring stronger light into its centre and towards the ceiling, with softer light where the seats are, where the walls are covered with grey bricks. 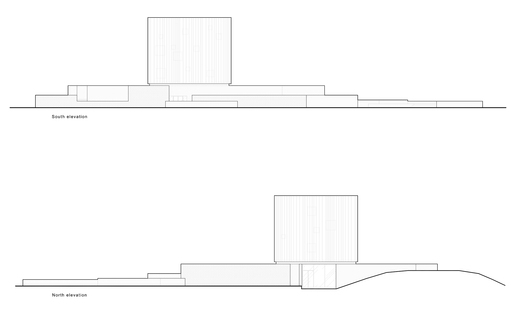 This traditional solution has been adopted by numerous architects designing places of worship, even in recent years, conceiving of the chapel as a brightly lit place which however has no windows in its lower part, so that worshippers cannot see outside. 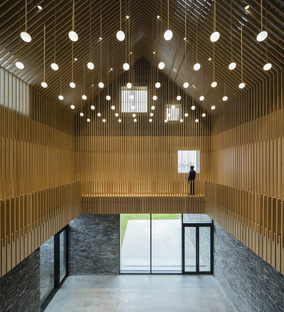 Inside it is an empty space 12 metres high on three levels, enclosed in a wooden skin which breaks up into strips at the level of the loft, forming a sort of cage to multiply light. 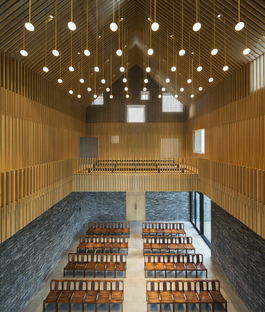 Round bronze lamps drop down from above, recreating am image of the firmament. 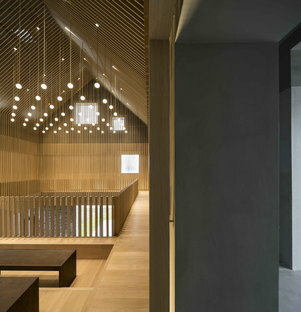 The polished concrete of the stairwell, the bleached oak interiors and the grey brick walls create an austere atmosphere, forming a plain building without any opulent trim in order to promote concentration. 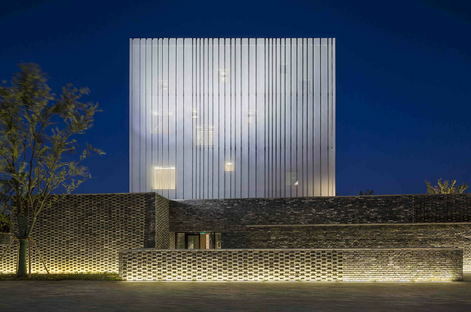 At night the temple’s metallic outer cladding covers reveals it as a box with windows in it, creating an extraordinary transparent effect.